U.S. President Donald Trump is expected to announce Tuesday his decision to end a program that protects from deportation people who were brought to the United States illegally while they were children. The officials also cautioned that Trump could change his mind. Deferred Action for Childhood Arrivals, or DACA, has given nearly 800,000 people a reprieve from deportation by providing two-year, renewable work permits for eligible applicants. House Speaker Paul Ryan speaks during his visit to Intel in Hillsboro, Ore., Wednesday, Aug. 23, 2017. 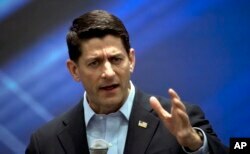 Ryan used his visit to the technology giant to talk about tax reform. Trump pledged during his campaign for president to eliminate DACA, calling it “amnesty.” Since taking office he has said the issue is one of the most difficult he has dealt with as president. Many of the people involved in the program came to the U.S. as young children and have no connections to their home country. As news of Trump's impending decision emerged Sunday, some members of Congress used Twitter to express their reaction. Rep. Steve King was one of the few Republicans to discuss Trump's plan. “Ending DACA now gives chance 2 restore Rule of Law. Delaying so R Leadership can push Amnesty is Republican suicide,” King wrote. But most of the lawmakers who commented were Democrats critical of canceling DACA. "DACA kids work, study, serve in military. Kicking them out undermines American traditions. This is an enormous moral and economic mistake,” wrote Rep. Brian Schatz. 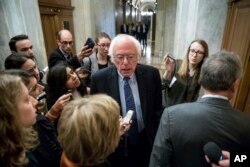 Sen. Bernie Sanders, I-Vt., center, speaks to reporters on Capitol Hill in Washington. Sen. Bernie Sanders, who ran for president last year, said if Trump does end the program, it would be “one of the ugliest and cruelest decisions” ever made by a U.S. leader. “If Trump ends DACA, Congress must act immediately to restore it,” Sanders wrote. Rep. Ted Lieu said the U.S. cannot be great without embracing immigrants and that he will stand with Democratic colleagues to protect Dreamers. “For all the members of Congress over the past 5 years who said DACA should've been done ‘legislatively’ here's your chance,” said Rep. Joaquin Castro.